Maёzo opened two months ago and already the venue has hosted a number of birthday and corporate events. Their spacious open-concept dining room with fold away windows is certainly conducive for large groups, but the well-spaced tables and booths also allow for intimate dinners – I, for one, am glad to not hear neighbouring conversations. 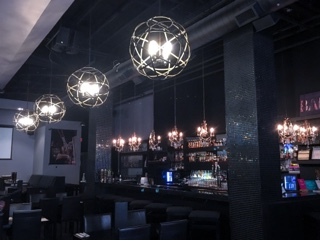 Owner, Amit Sukhwani, wants patrons to be comfortable (thanks to his history of hospitality from Aruba) and is bringing to Canada the flavours of India with a twist. 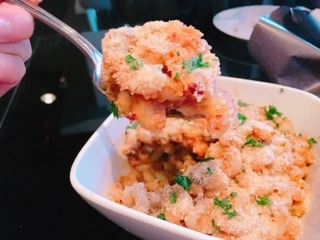 For example, for mac ‘n’ cheese lovers, their masala macaroni ($8) will hit the spot. 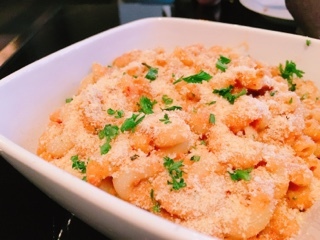 It’s not as sinful as the typical mac ‘n’ cheese, but the masala sauce still incorporates enough cream to make it satisfying, without being too heavy. The sauce has a manageable level of spiciness and is balanced out by the tomato’s acidity. Sharing is encouraged as the appetizer is substantial – it could even work as a main. Amit laughs when I comment on the size of the bowl, he agrees it’s a generous portion and does so to ensure no customer leaves hungry. 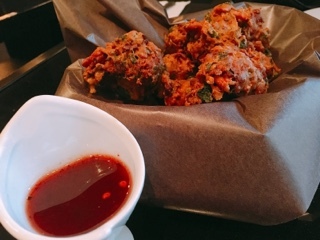 The monsoon basket ($12) arrives filled with crispy pakoras encapsulating a variety of vegetables within the batter - spinach, onion, potato and carrots from what I could make out. They’re dropped in oddly shaped balls allowing for a bunch of jutting edges creating more crispy surface space. The appetizer arrives with the traditional sweet and sour tamarind chutney, but if you order the lamb, they are go equally well with the chimichurri sauce. 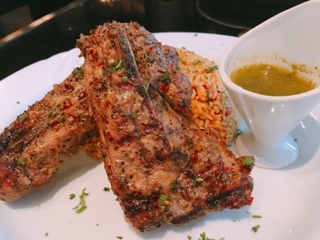 Although I enjoyed all the accompaniments with the lamb chops ($28) – the spicy rice is like “dirty rice” to another level and the chimichurri a cross between the tangy Argentinian variety and the spicy Indian mint chutney – the actual lamb is merely decent. The meat is rubbed in a nice medley of spices, but needs to be saltier. Moreover, the thick slices combined with the bone located in the middle of the chop means the centre arrives rare and makes it difficult to cut with a regular dinner knife. I generally don’t like butter chicken – often it’s too creamy or just tastes like tomato sauce. 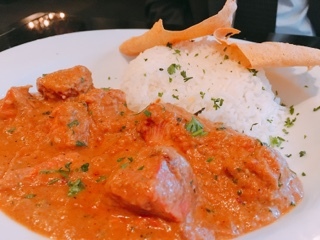 So, when I took a bite of my husband’s butter chicken ($18) I was pleasantly surprised with the well-balanced sauce. The family recipe the dish is based on doesn't go too crazy with the cream, instead also incorporating various spices to give it interest. Moreover, the cubes of chicken breast are juicy and tender. The gravy goes especially well with the spicy South-Indian tomato rice accompanying the lamb, Maёzo should consider having an “upgrade” option for those who want an extra flavor bomb. Amit explains that Maёzo, in Sindhi, means fun – a feeling he hopes guests visiting the restaurant will experience. The cheerful Top 40 pop songs that play throughout the dining room certainly creates a jovial atmosphere. Their weekday specials may also help - on Monday to Friday (from 4-7pm), the restaurant has $5.99 drink specials (bottled beer or a glass a house wine) and appetizers are 10% off. It’s a great opportunity to gather a group of friends and head to their central downtown location for a night of maёzo.